A GIS-based siren network design built by the county replaced the old system and saved $2 million. The new siren network design increased safety and should ultimately save lives. County staff used ArcGIS to track noise complaints, design a test strategy, and record the outcomes of these tests. In an age of fiscal uncertainty and budgetary restraint, one local government agency shows how intelligent planning can help build a better emergency response warning system—and save millions in the process. St. Louis County, Missouri, grapples with the continual threat of tornadoes. Its warning system—sirens spread out across the county in populated areas—supplies advance notice for citizens to move to protected areas before the next powerful twister strikes. Yet time waits for no one—or disaster. The system of outdoor warning sirens had been in place for more than 40 years, with most sirens in the system between 20 and 40 years old. Sirens were breaking down or malfunctioning, and the county had grown over the last four decades, with more people spread across a wider area, requiring new sirens. Siren loudness in the area in and around St. Ann, Missouri. Output is from the SPreAD-GIS sound model, written in Python for ArcGIS for Desktop. The numbers show field measurements in c-weighted decibels. A GIS-based design built by the county helped replace the old system—and saved more than $2 million in the process. The original plan involved replacing or upgrading 210 existing sirens and installing 50 new sirens to cover the entire county at a cost of more than $10 million. 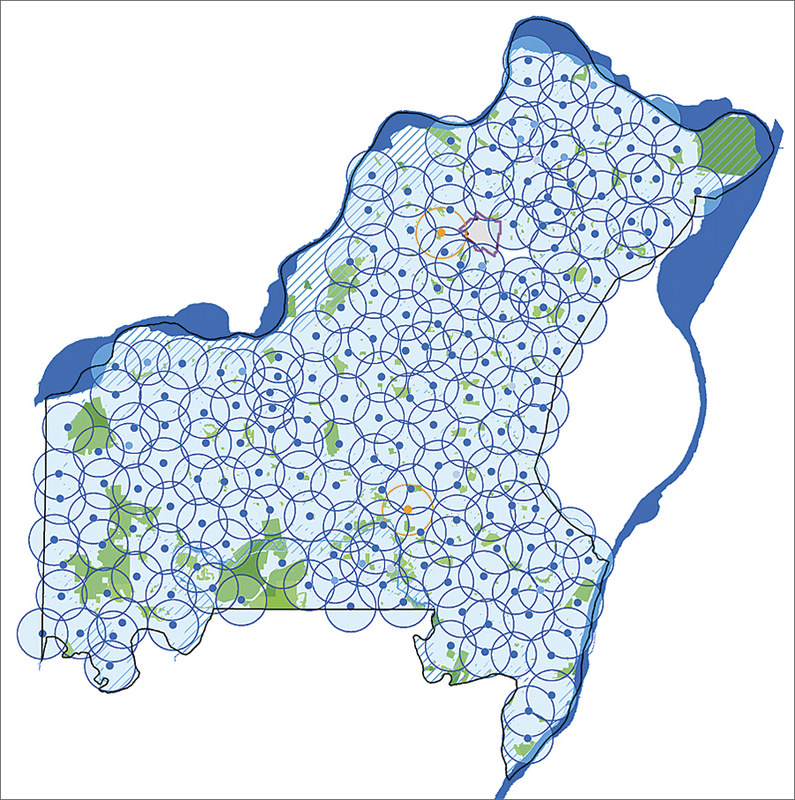 Using GIS to map siren coverage and spatially plan out all the details involved in creating an up-to-date network, county staff developed an improved design that required only 169 new sirens for a total of 185 sites. This resulted in a project that cost $7.5 million, which was not only nearly $3 million under the original projected bid, it was more than $2.4 million under the budget allocated for the project. St. Louis County, Missouri, is part of the St. Louis metro area yet borders the city of St. Louis, which is independent from the county. The county has a population of nearly one million. 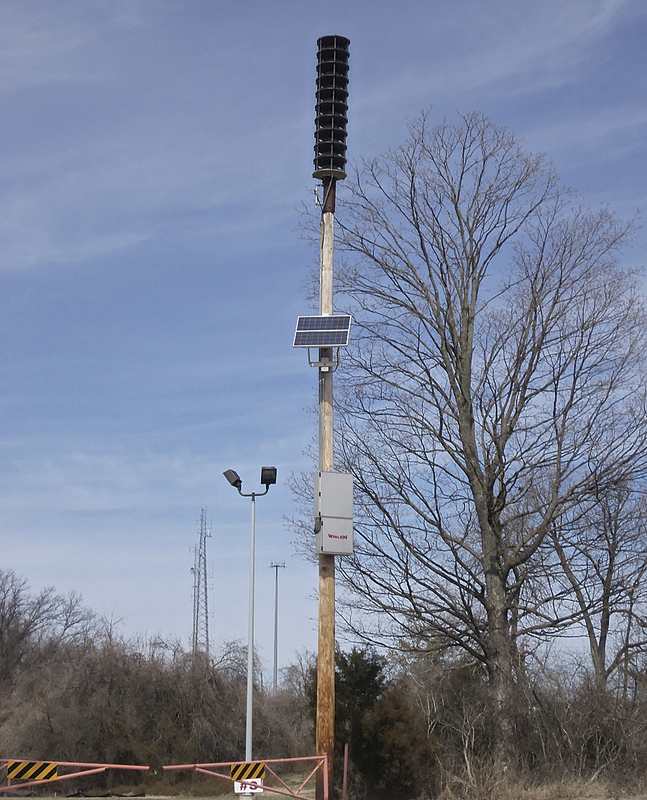 The county previously maintained 210 outdoor tornado/disaster sirens: 194 of these models needed to be replaced and the 16 others upgraded to meet new radio standards. The county performed a study in the 1990s that determined an additional 50 sirens were needed to cover the western unincorporated part of the county, which today mostly comprises the city of Wildwood. In 2009, an emergency communications sales tax passed that included $10 million to repair and extend the siren system. Yet, when county staff conducted a price feasibility study, they found that $10 million was not sufficient to rebuild the system and fill gaps, much less purchase new communications equipment and take care of potential incidental costs, such as land purchases. This siren is placed on a side entrance to Faust County Park from Olive Boulevard in Chesterfield, Missouri. Insofar as the county was a longtime user of ArcGIS for Desktop and ArcGIS for Server, expanding into an enterprise GIS during the last five years, when confronted with this unexpected problem, Lord-Castillo came up with the original and novel idea of a complete system redesign. In an ideal seamless coverage, the county sirens are arranged in a regular hexagonal grid, with side length equal to the radius of the siren. 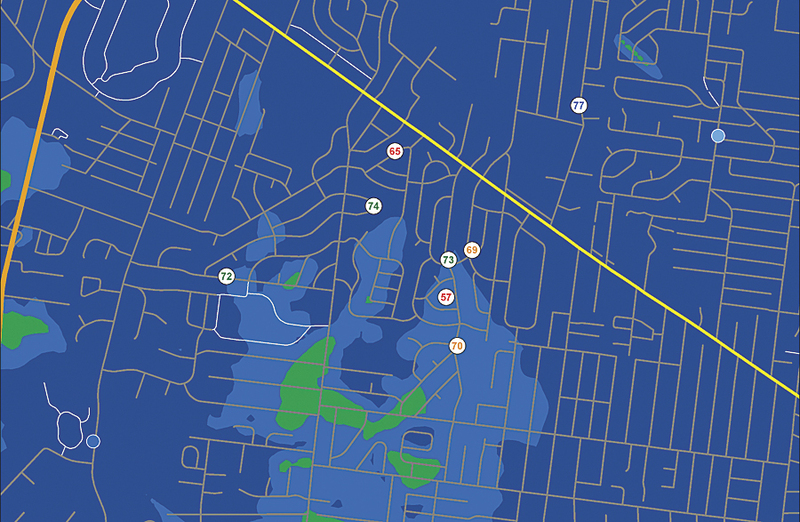 As a proof of concept, Lord-Castillo overlaid this type of grid over the county. He excluded areas that would not be covered by the new system, such as state parks and undeveloped floodplains. Under this optimum model, the siren count would be brought down to 211. That shaved more than $2 million off the cost of the system. To learn how to effectively arrange a siren system, Lord-Castillo carefully studied Federal Emergency Management Agency (FEMA) design guidelines. He further consulted siren vendors and even received feedback from existing siren system design firms. An independent engineering consultant already hired by the county for a different project validated the design procedures as a last step in the system design process. In addition to targeting high-noise areas, three other criteria were needed for fulfillment: public land use, pavement access, and high ground placement. After conducting research and examining FEMA procedures, the county went to work on building out the system. The first step was getting the right data records and mapping the different variables to find matches for all three previously identified fulfillment requirements. The sirens needed to be placed on public land whenever possible since eminent domain would not be applicable. The first preference was county-owned land and rights-of-way. Fortunately for emergency management staff, the metropolitan sewer district constructed an impervious surfaces dataset in 2005 that covered most of the county. This dataset was used to select public land paved areas, other than roads, as additional possible sites. The current countywide coverage in the new system, including two planned future sirens. County parking lots and public driveways were analyzed for site access. Lord-Castillo created mapping buffers around the street centerline data layer corresponding to the type of road. Secondary roads were considered two lanes, and major roads were considered four lanes. Interstates and major highways were excluded, since they were too dangerous for maintenance access. Once the paved surface layer was built, a 10-foot outside buffer around these sites was created. Why an outside buffer? The county had to place the sirens adjacent to these roads and parking lots; they could not be placed in the roads and parking lots. An analysis was done combining countywide digital elevation model data with neighborhood focal statistics to construct a local standard deviation of elevation grid. This would ensure the sirens were placed on local high points relative to surrounding warning areas. Each of the eventual 183 new sites had to be individually placed using these criteria selection layers. Sixteen existing sirens from the old system were retained because they were modern-generation siren models. These sites were placed on the GIS map first. From these sites, the county expanded out to place each new siren to achieve seamless coverage. A site that fits all the needed criteria can have other obstacles as well. The foremost obstacle was overhead power lines. The next was trees, especially trees south of the solar-powered sirens. Storm sewers presented an additional obstacle, and no siren would be placed within 100 feet of a building unless there were no other feasible locations. These latter two issues were dealt with using sewer line and building footprint data from the sewer district. Staff used ArcGIS to track noise complaints, design a test strategy, and then record the outcomes of these tests. In most cases, testing found that the system was performing as intended. In a few cases, though, the agency found that large buildings, unusual terrain features, or loud highways made it difficult to hear the sirens above ambient noise. The system design now stands at 199 sirens. This is still a savings of $2.4 million over the originally proposed 260-siren design and a dramatic savings in maintenance costs too. More important, the new system covers more than 99 percent of the just under one million people in St. Louis County. The previous system covered roughly 80 percent. For more information, contact Brett Lord-Castillo, GIS programmer, St. Louis County Police.